Publication : June 14th 2012 by Dial Books For Young Readers. I don't even know where to begin. I had My Life Next Door on my wishlist for quite some time before I worked up the courage to request Huntley for an ARC and let me tell you, she's absolutely wonderful! I know, I know, most authors are awesome, if not all, but Huntley is seriously one of the nicest, friendliest person/author I have ever come across. Luckily, I had the privilege of interviewing her. How did you celebrate when you got signed for your first book, My Life Next Door? At first, I was too stunned to celebrate. I could barely speak. My wonderful agent, Christina Hogrebe, had to gently say “This is a good thing” before any words came into my head. Then of course, when I hung up after being calm, I danced around the house. And met my kids at the bus-stop with candy. And bought a Kindle. Why YA Contemporary for your first book, any particular inspiration? I have always been a huge believer in the YA genre, even before it was called that. I spent my teenage years turning to books to try to navigate real life. While I read and love Dystopian and Paranormal YA, I am so interested in the struggles and dramas and triumphs of everyday life that it just seemed a natural fit. In addition, I love teenagers—the questions they ask, the way their minds work, the passion they bring to their uncertainty and changing beliefs about the world. Teenagers question everything and aren’t easily fooled or brushed aside. It’s an audience I really respect. Name 3 things you can't live/can't get through your day without? Iced tea with lemon, something that makes me laugh a lot and a book that lingers in my mind. I’m a really fast reader, blessing and curse, and generally read a book a day, when I’m not on deadline. When I’m writing my own stuff, I try to stay away from anything but non-fiction, as I’m always worried someone else’s tone will seep in. When I look at my childhood writings, I can always tell who I’d been reading at the time. And I sure don’t want to do that now! If you got three wishes, what would you wish for? So tricky. I always trip up on this question. We all want world peace and tolerance, a greener planet, a safer world. But, as Cassandra Clare put it in her beautiful book THE CITY OF GLASS, “perhaps people were supposed to find these things for themselves.” Then, I wonder about wishing to remove some obstacles and misfortunes that happened to people I love, but worry that those are connected to the good things as well, and if you pulled the thread too much would unravel. So, I’m just going to be frivolous here, and say I wish I had a housekeeper who lived in a lamp, like Aladdin’s genie. I could rub it and have her come out and do the laundry and the dusting and the vacuuming and the grocery shopping, and all the boring things, then wish her gone. I’d love a magic elevator/portal where I could crowd my family in, push a button and whisk us off to London or New York City or California. And, finally, I wish there were a pause, rewind and replay button on time, so I could relive the amazing—my children’s early childhoods, our best vacations and happiest days—and the awkward—my dumber high school moments, bad dates, etc. I have a good memory, but some things—and moments—and people-- you’d just love to see again.! Mind-reading. Think of the fabulously uncensored thoughts I’d hear….all those true stories. Mind you, it could get really painful. But I would take that to just know what was REALLY going in in people’s heads. If you were stranded on a deserted island and you could pick one person to be with you, who would it be? This is where my practical side wars with my imaginative side, and I try to think which gorgeous actor/historical/fictional person I’ve ever crushed on would be best at making a fire and spearing fish. And how did I get here from chocolate? When/How did you decide you wanted to become an author? The first time a book ever completely swept me away. I was five. It was E. B. White’s Charlotte’s Web, a book I still return to when I forget how gorgeous and evocative simple language can be. My father read to me, and when he got to Charlotte’s death, I was inconsolable. He took a pencil and crossed out “and then Charlotte died” and wrote “and then Charlotte did not die”. And I realized that a writer could do that—create a world that evoked such powerful feelings….and change it around. Romance. My husband loves watching horror movies at night, and my oldest daughter can journey with him there, but I just cuddle up and find a great love story, trying to drown out the screams. If you could travel anywhere in the world, where's the first place you'd want to go? London, Scotland, Wales and Ireland—where most of my ancestors came from. I spent a year in London in college and I’m still a bit homesick for it. That travel-elevator-portal of my previous wish would be very handy here. Giveaway is International, as long as The Book Depository ships to you. Winner has 48 hours to respond before I pick a new winner. Prize will be a pre-ordered copy of My Life Next Door by Huntley Fitzpatrick which the winner will receive TBD after publication. I love reading YA. These novels are almost always extremly well written and super entertaining. My Life Next Door is on my wishlist since I first heard about it. Hope to read it soon. My favourite YA contemporary novel is Anna & the French Kiss by Stephanie Perkins! <3 I am really dying to read My Life Next Door too! I love the cover. I think it's perfect for the story! My favorite compoporary novels are Jellicoe Road,Stolen,The Sky Is Everywhere,Lola and the Boy Next Door,Summer series,Going Too Far,Before I Fall and The Storyteller. Can't wait for My Life Next Door! June come faster! My favorite YA contemporary would be Forbidden by Tabtha Suzuma. Thank you foe the giveaway! Thanks so much for the giveaway! Awesome interview! I am so so so excited for this book! It sounds perfect for me and the cover is GORGEOUS! My favorite YA contemporary is Anna and the French Kiss, Before I Fall is great too. And that cover is so beautiful! I am DYING to read this book. My favorite contemp is Lola and the Boy Next Door, and I really think My Life Next Door will be up there with it. I adore The Summer series by Jenny Han and The fault in our stars by John Green. I really like this cover, it seems like they're hiding... by standing next to that HUGE fence. I also like how they look happy together, with the sun shining and the flowers in bloom. It sounds like maybe it's a secret romance! I'm dying to read this book! And it releases on my birthday!! :) Thanks for the giveaway! My favorite contemporaries are John Green's books. Of those, I love Will Grayson, Will Grayson the most! Also, LOVE THIS COVER. It's perfect. Great interview Huntley! I'm sooo looking forward to reading My Life Next Door! As for favorite YA books, anything by Sarah Dessen just rocks. I've also found a ton of Indie YA authors who are fabulous. Kat Calen and Renee Pace come to mind as do Maree Andersen and Jo Ramsey. All Good! I LOVE Ya books. Anna and the French Kiss is my favorite. I also like Sarah Dessen's books and the Summer Series by Jenny Han. This book looks so cute. I really want to read it. The cover is sweat. What a great interview! I LOVED your wishes, both your rationale for not making the usual ones, and why you made the ones you did. My fave cont. rom. right now is Perfectly Hopeless. This book looks interesting and the cover is cute/sweet! This was one of my WoW's a couple of weeks ago. I love contemporary YA. Some of my favorites books are from John Green, Stephanie Perkins, and Sarah Dessen. I think the cover is cute and looks like a perfect summer read. Loved this interview! Made me more curious to read the book than the cover had already managed to do! One of my favorite YA contemporary is Forbidden by Tabitha Suzuma. This seems like a great book and I can't wait for it. I LOVE YA contemp. Some of my favourites include: Anna and the French Kiss (Stephanie Perkins), Wanderlove (Kirsten Hubbard), Harmonic Feedback (Tara Kelly) and Good Oil (Laura Buzo). I cannot WAIT for this book! I've been hooked on this release from the very start, and I'm crossing my fingers that it does not disappoint. It seems not to have, looking at the reviews so far. I love YA contemporary.My favorite would probably be Anna and the French Kiss by Stephanie Perkins.The cover for My Life Next Door is absolutely gorgeous. Fabulous interview!!! I love YA contemp. I recently read and LOVED Wanderlove by Kirsten Hubbard. Stephanie Perkins series is just fabulous as well!!!! You have no idea how long I have had this book on my wishlist! I cant wait until it releases =P I love contemporary books kyaaaaaaa!! I really love your interview! is so fun and it let me know a lot about the author! uuh btw, I cant go a day without Ice lemon tea either XDDD Yay for tea!! anyway, great interview, and the cover is gorgeous! OMG I am DYING for this book! (it's actually going up as my Waiting on Wednesday post tomorrow!) It just sounds so fabulous and wonderful and I love books that concern family and their dynamics. I love this interview, and my heart just exploded when I read about her father crossing out the "Charlotte died" - that's a wonderful inspiration and a fabulous father. Hullo...okay, well, I am a serious John Green junkie (ask my daughters, I cannot stay away from his vlog). And Sarah Dessen...oh my (Deb Caletti, too, guys). I too adored Wanderlove. And I barely restrained myself from jumping up and down when meeting Stephanie Perkins, which would have been uncool, but I've never done cool particularly well. Or at all. I have heard so much about Jellicoe Road but I haven't read it and I'm going to pass all this on to my daughters til I'm done with deadline. I hope. Excercising discipline. I love new recommendations and it's great to see how many people read and love the authors I love. My fav contemporary is Sometimes It Happens. I loved Welcome Caller, This is Chloe! I do really like the sound of this one. I think it's a more common situation than one might imagine. My most recent Contemp YA was Pieces of Us by Margie Gelbwasser. I love contemperaries, Sarah Dressen comes to mind, and this sounds really good as well. Thanks for the awesome giveaway! I love any Sarah Dessen book. I can't wait to read this one and I love the cover! As of now my Favorite YA Contemporary author is Kirsten hubbard-Wanderlove. I adored the book. I would love to read My Life Next door. I like the cover. I want a backyard like that!! I loved Lola and the Boy Next Door and look forward to this book because I love a romance involving the boy next door. Thanks for the giveaway! My fav this year was Ashes, can't wait for the sequel. my favorite could be before i fall or what happened to goodbye : ) I am very excited to read my life next door!!! and love the cover! So much amazing contemp I could never pick a fav. But I really liked In Between by Jenny B. Jones. The cover is beautiful! this book looks really great! Thx! My favorite contemporary is Before I Fall by Lauren Oliver. 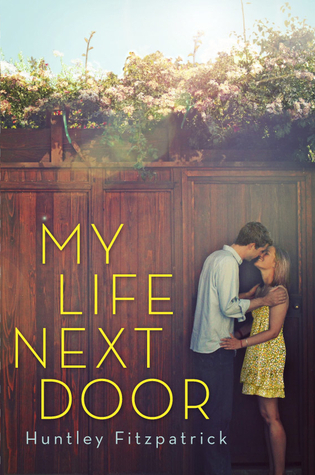 I very excited for My Life Next Door, it's definitely one of my most anticipated summer releases! Fav YA contemporary? Geek Girl by Carly C. Bennett & yeah, I'm really excited about this one & Iove the cover. I think I haven't read any YA contemporary yet. I have several in my TBR list but I always manage to put it off until now, silly me *sigh. This book sounds great. I love the cover, beautiful and very romantic :) And the blurb is awesome. I also enjoyed the interview with the author. She sounds like a really romantic and easy going kind of woman :) I think her personality would be reflected in the book. AND YES, I'm so excited about this book. I like the premise. I believe I'm going to love the story, the characters and the writing as well. The cover is so sweet. Mehe. I think Huntley is such a romantic person. I can't wait for this! I am always excited to read new books, of course. I will be very happy to read your book, thannks for the chance. Can't help but love contemporary YA-one of my favorite authors in the field, after all, is Sarah Dessen! I love how the author compares chocolate to taste in general. As I get older, I find I too appreciate more the bitterness of stories instead of a generic happy ending. (I also seem to have lost my sweet tooth too :P) There's just something about a sad ending that gets to you more than a happy (and sometimes stereotypical) ending does. Looks a great read and I love the cover. Some of my favorite YA Contemporary books are Lola and The Boy Next Door, The Truth About Forever, Just Listen:) I'm dying to read this book. I like the cover is cute! Can't wait to find out if My Life Next Door will be joining this list. :) It's been on my wishlist for a long time now. My favorite contemporary YA are Graffiti Moon by Cath Crowley and Stillburrow Crush by Linda Kage. I like the premise of this book. It's definitely something I'd see myself reading. Oh, I love that part where her father crossed out "Charlotte died". So sweet! I like the cover and the description made it sound like a great book to read. Great interview! My most recent favorite contemporaries are The Probability of Miracles and The Probability of Love at First Sight. Great interview! I'm really excited to read this book! I LOVE the interview! The questions are fantasitc and the answers are even better! I adore the cover, it's sl beautiful! My favourite YA contemporary is probably Before I Fall before Lauren Oliver; such a great book! And well, I've never heard of the book My Life Next Door until your interview, but it sounds completely awesome! I recently read Catching Jordan and that was a fun book. I love YA lit! I write a blog about debut YA authors and their novels and absolutely cannot wait to read this one so that I can write about it! My favorite is definitely Anna & the French Kiss by Stephanie Perkins, what an awesome book it is! I hate to repeat all these people, but Anna And The French Kiss by Stephanie Perkins is my favorite YA contemporary right now. My favourite YA contemporary novel is Anna & the French Kiss by Stephanie Perkins. Great interview! :) I absolutely love the three wishes you chose, that's probably exactly what I'd choose! Also, I know exactly what you mean about bittersweet vs. happy endings. I absolutely love bittersweet endings now. Maybe I'm a masochist, but if an ending has me crying, I just absolutely love it haha. I'm trying to think of my favorite YA Contemporary... and I'm just blank.. and then I realized that most of YA Contemporaries I've read that made a mark on me had really sad endings.. I don't know.. maybe because those sad endings do happen and they are a part of reality. I'm dying to get my hands on this one. It looks like the perfect summer read. One of my favourite contemporary authors is Sarah Dessen. Her books have an overall arc that's predictable but I think that's why I like them - you know how things are going to end up - and she's a good writer. Thanks so much for the giveaway. I really dont have a favorite YA contemp. I love a lot of them. This one looks like such a good read when school gets off!!!! Kve heard so many good things about it! Haha, lucky kids! ;) Mom gets a book deal and they get candy? Sweet, pun intended. I'm always a little paranoid about a set of controls on life that let you pause, rewind, etc. after watching that movie Click (scared me to death) but I love the idea of having an elevator that could take you wherever you wanted! Thanks so much for the giveaway! Fingers crossed - I can't wait to read this book! And maybe it's silly, but I always curious about any novel that has "next door" on its title. And I really love this cover. Thank you for making this interview and giveaway. Love it! Contemporary YA is my absolute favorite, with Sarah Dessen being my favorite author. As for this book, I saw it as a WoW months ago, and have been salivating at the chance to read it ever since. I love the cover and it makes me want to dive right in. My favorite contemporary would be BELLES and WINTER WHITE, those two my Jen Calonita. I LOVE THEM! My favorite Contemporary is Wanderlove! I love everything about that book! It is just simply wonderful! And I cannot wait to read My Life Next Door! I have had it on my TBR list for awhile and it sounds so so good! Glad you liked it!